A sullen panda asks his animal friends if they would like a doughtnut. But each time, the animal Mr. Panda approaches demands a doughnut rather than requests it politely. So each time, Mr. Panda changes his mind and walks away, leaving each animal without a doughnut. 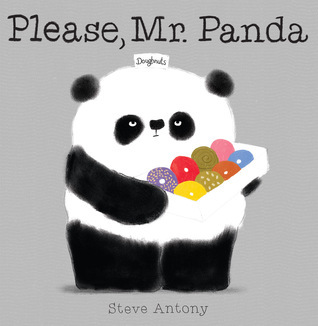 On the surface, Please, Mr. Panda appears to be a book about manners. Approaching it as a way to teach kids a lesson about politeness might be the wrong way to go about it since Mr. Panda was a curmudgeon and not very polite himself. So I chose to perceive this story as more complex than just a simple, didactic book about saying please and thank you. I tried to approach reading Please, Mr. Panda more the way I would a book like I Want My Hat Back or Ugly Fish than trying to make it a simple book that teaches a black and white lesson. I think Steve Anthony was trying to be more subversive than didactic. As a result, I could see this book being a good conversation to have with kids about flawed/unreliable narrators. A couple questions I might ask would be, was the panda's behavior justified in trying to get a polite response from the other animals? Was Mr. Panda being a hypocrite to ask for the other animals to be polite when he was rather rude himself? Better yet, rather than asking those questions, let kids come to those conclusions on their own. You'd be surprised at the insights kids can glean from stories without such leading questions from adults. For that reason, I could see this book sparking lots of interesting discussion.